Monitoring tyre geometry i.e. the measurement of radial or lateral unbalance as well as side wall detection for bulges, constrictions, dents etc., is one of the most important inspections at the end of the production process. The TGI 8302.LLT system can be easily integrated while offering precise measuring results. The system TGI 8302.LLT uses three profile sensors which reliable detect bulges and constrictions as well as radial and axial unbalance. The sensors are integrated in a robust mechanics and applied in such a way that the total surface of the tyre can be detected within one rotation. 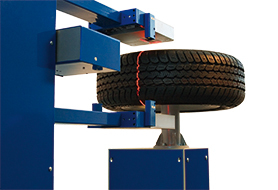 Thereby, the tester visualises the tyre surface, hides the tyre lettering, enables filtering of data, performs a vibration check, inspects the tyre size and classifies the degree of a defect.